Waterfowl are plentiful in the riparian areas and include Barrow's Goldeneye, the colorful Cinnamon Teal, and possibly the elegant Trumpeter Swan. Sandhill Cranes nest in the local wetlands as Red-winged Blackbirds trill out their territorial songs and Wilson's Snipe winnow overhead. Soaring raptors can be seen at any time including Northern Harriers, Swainson's Hawks, or a soaring Bald Eagle. The often overlooked sagebrush complex offers another group of notables including the Greater Sage Grouse, Brewer's Sparrow, Sage Thrasher, and possibly a Short-eared Owl. The mature aspen groves in the foothills of the mountains are home to a number of woodpeckers and passerines, including spectacularly colorful species such as the Mountain Bluebird and Western Tanager. 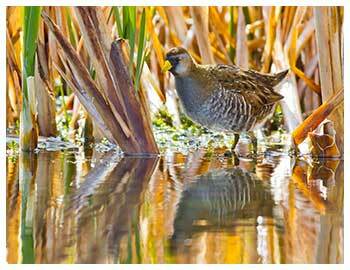 With a little luck we might even spot one of our seldom-seen owls or get a glimpse of a Sora Rail wading through the cattails. I am intimately familiar with the Sublette County, Wyoming birding scene, spending numerous hours in the field at any time of the year. I not only use my vision to locate birds but more often I listen for it's song or call. Besides locating and identifying a species, I am always observing bird behavior. Birding is a life-long passion of mine. I can tailor a trip to your level of birdwatching experience and physical abilities. For beginners, the trip will include many tips on improving your birding skills, such as taking in the entire habitat, bird signs, and identifying bird songs and calls. For experienced birders and Life Listers, I may be able to show you a specific bird or we can intensely try for as many species as possible in a set amount of time. Typically early morning hours are utilized to take advantage of the best bird activity. With birding being the emphasis, we will also identify wildflowers and observe the abundant wildlife of the area. I guide under Two Rivers Emporium's public land permits. For more information and pricing please check their website at www.2rivers.net. I had a fabulous spring birding tour of Sublette County with Elizabeth. We walked through the woods to see and hear ruffed grouse drumming, found branching great horned and long-eared owlets at spots Elizabeth had discovered, saw a great variety of shorebirds and waterfowl, and watched magnificent raptors, including a short-eared owl, soaring above the rocky outcrops near the highway. Over sixty species of birds in one afternoon. Elizabeth knows every stretch of the county, and is passionate about birds, knowledgeable about habitat and easy to spend time with. Check out her magnificent photographs. The photographs and text on the pages of this website are protected by the Copyright Act. It is illegal to reproduce, copy, or scan these images without the written permission of Elizabeth Boehm Photography.